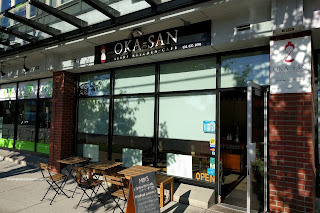 Okay, this post on Oka-San has been nearly a year in the making. We've actually dined here on 4 separate occasions. Finally I decided to get down to writing the post! The whole reason we've done so many return visits is due to the kiddies absolutely loving Spam Musubis. Actually, I remember picking up one every morning while Viv and I were in Hawaii back in 2004. A few Summers ago, the kiddies got their first taste of it in Hawaii and they've craved it ever since. 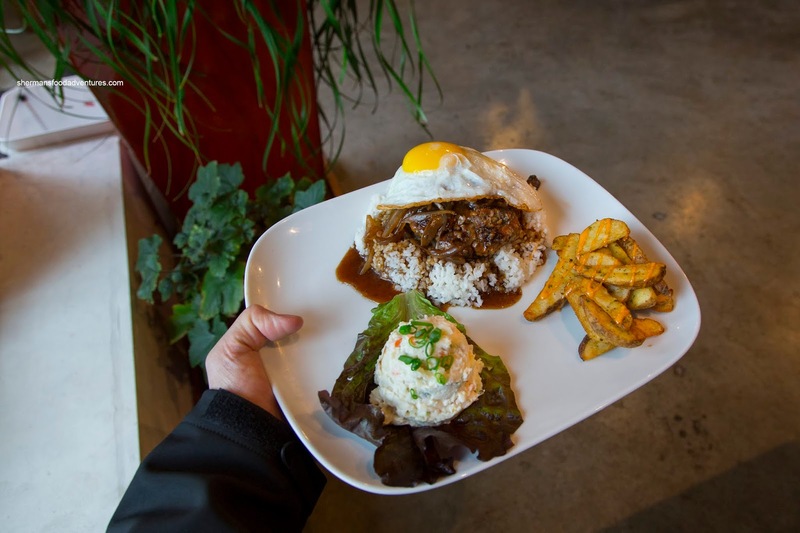 In addition to musubi, they serve other Hawaiian favourites with a Vancouver twist of course (like many other different cuisines). Unlike our first visit, we decided to try their creamy srirracha Poke Bowl over the original. For me, I think both are good, but if you wanted a kick, then the spicy one is the way to go. 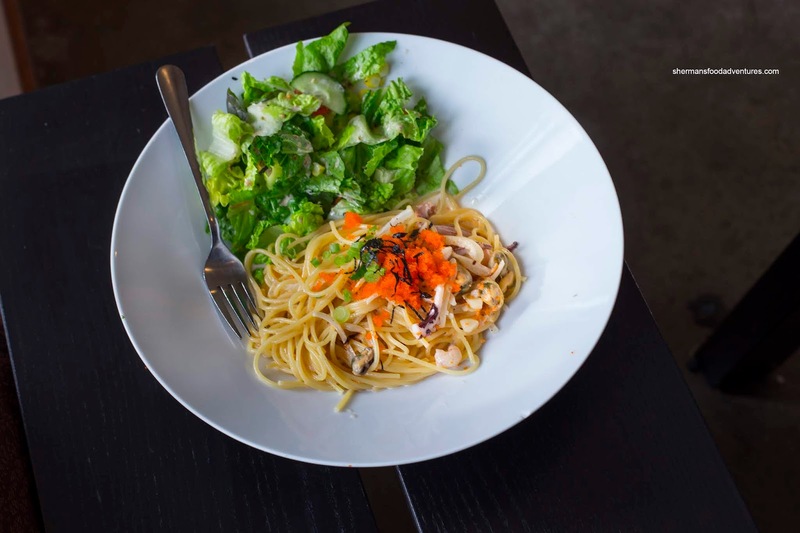 Instead of the aromatic sesame oil, it was replaced by a mildly spicy creamy dressing that was just enough to coat each piece of buttery fish. The rice was chewy and slightly dusted with togarashi. 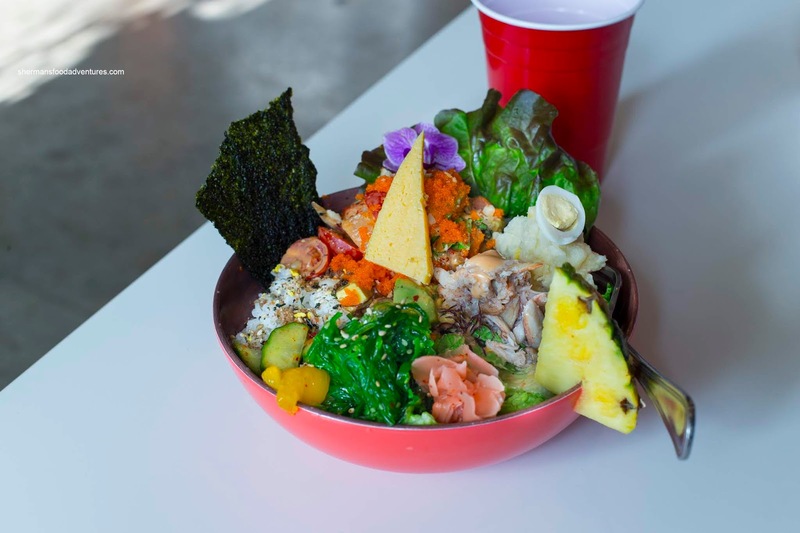 Added into the mix was wakame, crispy seaweed, lettuce, avocado, crab meat, cucumber, tobiko, mac potato salad, red onion, radish and pickled ginger. As such, this was one hearty bowl with varied textures and flavours. Everything seemed to work well with each other but I thought there was a bit too much red onion as it was pretty pungent. To be honest, there was too much stuff to make this a legit poke bowl (should be fish and onion only), but it works in Vancity. We got other Hawaiian dish in the Loco Moco featuring a hand-made beef patty atop rice and smothered in a mushroom and onion gravy. It was served with potato wedges and potato mac salad. The large beef patty was meaty and lean with bits of sweet onion strewn throughout. I thought it was nicely seared with caramelized flavours while the gravy on top was flavourful and rich. Once again, there was far too many onions in my opinion as it tended to throw the flavours out-of-balance. Maybe I'm being too picky, but I would've liked a classic mac salad on the side rather than it being mixed with potato. 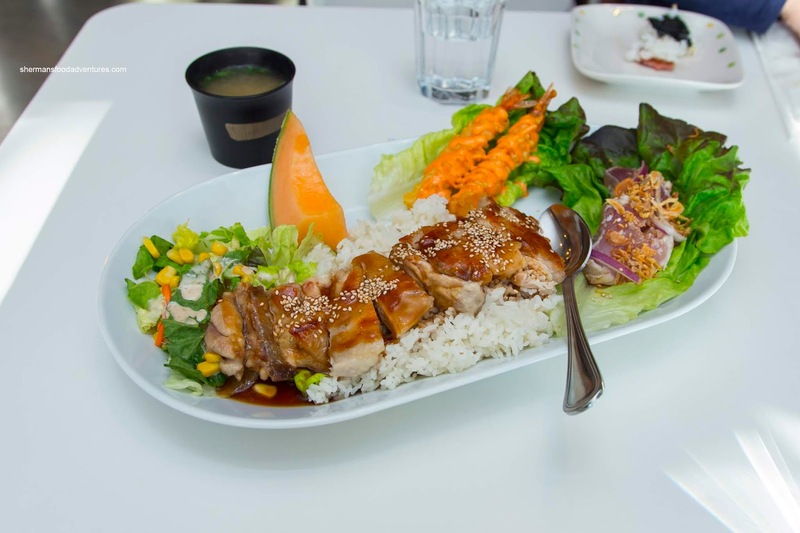 Also on the table was Chicken Teriyaki with Ebi Mayo and Tuna Tataki. Chicken was tender with only a touch of sweet sauce. It definitely could've used more. My son went to his go-to dish - Spam Musubi. Yep, the last time we were in Hawaii, he ate these like there was no tomorrow. 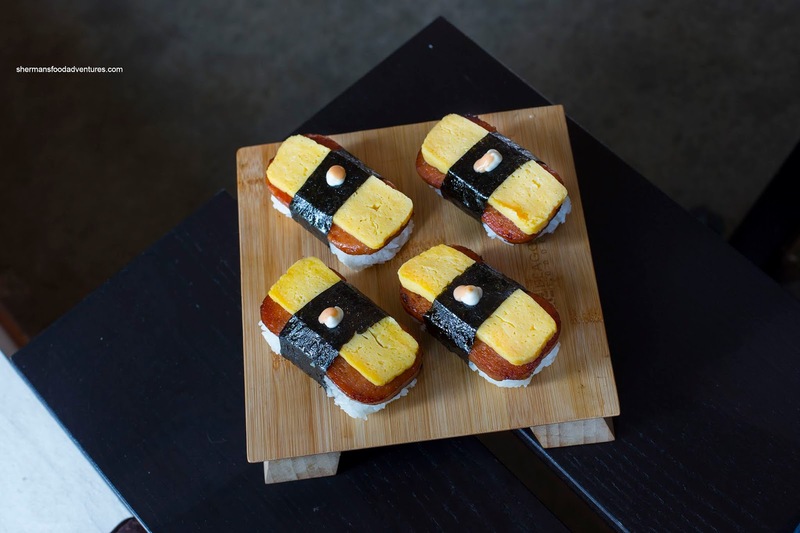 As simple as these can be (essentially sushi rice topped with seared Spam and held together by nori), this has to be one of the better versions in town. In fact, there aren't many places that serve this period. The rice was chewy with the right amount of moisture while the Spam was caramelized with a sweet tangy glaze. They added a piece of fluffy tomago on top for good measure. These were a lot more filling that one would expect. Of course this wasn't the only thing he ate, so he went ahead and had his other favourite being the Unagi Don with a side of Tuna Tataki and Wakame Salad. 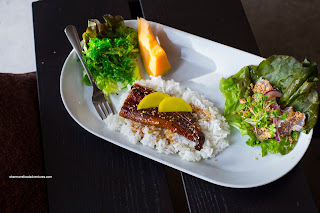 Again, the rice was on point with a chewy and not too wet texture where the buttery unagi helped flavour most of it. We could've used one more piece though. The tuna tataki was buttery and soft while seared just ever-so-slightly on the outside. Loved the sweet, salty and tangy dressing that also had sesame oil. My daughter wasn't in the mood for most things on the menu except the Masago Spaghetti. Portion size was modest, but the execution was good with al dente pasta enveloped by a fairly creamy sauce that had a bright brininess from the masago. Not sure of the onions though as it was a bit strong for the sauce. 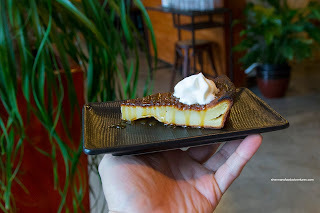 Lastly, we tried their Butter Mochi Cake which was semi-sweet and aromatic. Loved the crispy exterior textures giving way to the soft and slightly chewy interior. So from all these visits, we can definitively say that the food at Oka-San is generally good. Sure, some creative license has been used on the dishes here, but nothing is offensive. Prices are on the higher side, but the quality makes up for up. However, one of the biggest issues is the time it takes for the food to arrive. Yes, in "Mother's" restaurant, it should take more time as she puts her love into making the food. On the other hand, don't expect to get out of there with a quick meal.